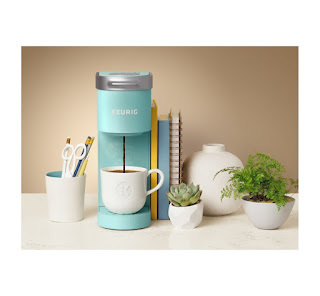 This weekend head to Target.com to take advantage of the 25% off Kitchen gifts to score this Keurig K-Mini Single Serve K-Cup Pod Coffee Maker for just $52.49. This new Keurig K-Mini single serve coffee maker features a new sleek design, and at less than 5" wide is the perfect size for any space or occasion. The K-Mini brewer is effortlessly simple to use - just add fresh water to the reservoir, pop in your favorite K-Cup pod, press the brew button and enjoy fresh brewed, delicious coffee in minutes. Plus, use your Target REDcard to get an additional 5% off. And remember shipping is FREE. Start your order here.